If you have a morning commute in the Washington, D.C. area, here is some good news: a now-excommunicated member of the trucker ride to jam up the Capitol Beltway and arrest the members of Congress now says it's all a hoax. But organizers say it's definitely happening. Here's the backstory: news about the jam-up by the truckers, who are angry about a litany of things including the national debt and what they say is overregulation of their industry, went viral after U.S. News & World Report wrote a story on it. In it they quoted an organizer named Earl Conlon, who was the one who said that Congress would be arrested by a "citizens grand jury" created without court approval. But now, speaking to the Washington Post, Conlon said the whole thing was just a ploy for attention. 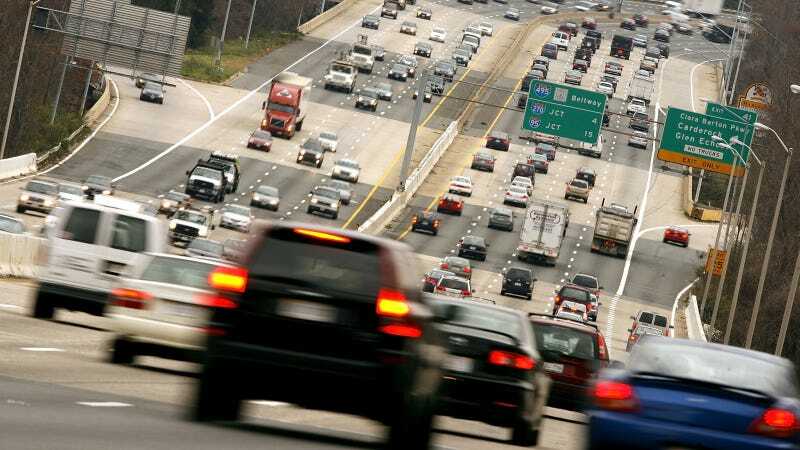 So while thousands of truckers may indeed come to Washington on Friday and many of them may travel along the inner loop of the Beltway, honking their horns, they won’t intentionally shut down traffic, he said. In fact, Conlon is not sure that he will even make it to town on Friday. Emphasis mine. Good for him for realizing that this traffic jam would just affect normal people commuting to work, not the politicians they loathe so much. After all, most members of Congress live in the District itself; they don't need the Beltway to get to work. The thing is, the event seems like it is still happening. After the U.S. News story ran, the group began distancing themselves from Conlon and saying they do not plan to brake check police officers or arrest members of Congress. And the group's Facebook page and website are still going strong, with some 65,000 likes and no indication that it was a hoax. "One of our demands is NON-NEGOTIABLE: President Obama must be removed from office for crimes against the United States and all unconstitutional executive orders nullified. How that is accomplished legally is for the legal and constitutional experts to determine." I guess we'll find out on Friday, won't we?